Rolfing Library appreciates your generous desire to donate materials to our collection. 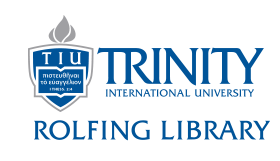 We gladly accept donations from the TIU community of scholarly books. Please note that we may not add every item from your donation into our collection. By agreeing to donate materials to our library, you accept our right to do whatever we deem appropriate with the materials. For example, if we already own an item, if it is outdated, if it is in poor condition, or if it does not fit within the scope of our collection, we have the right to dispose of it. We typically place any books that we cannot use onto a cart near the circulation desk, where students may purchase them for $1.00. Please notify us before bringing any donations to the library. If you have any further questions regarding donations, please contact our Collection Management Librarian at (847) 317-4009, or email at erlang@tiu.edu. We are grateful for your partnership in providing our student body with the materials they need to excel at Trinity and thrive post-graduation. Thank you. Please fill out this form to accompany your donation.